InclusiveLondon.com, which provides access information about hotels, restaurants and tourist attractions in the capital, is a legacy that others will aspire to. InclusiveLondon.com is for all those with access requirements. At a recent event held to celebrate London 2012’s focus on diversity and inclusion, Minister for Equality Lynne Featherstone and other VIP guests pointed to InclusiveLondon.com, which provides access information about hotels, restaurants and tourist attractions in the capital, as a legacy that others will aspire to. InclusiveLondon.com is for all those with access requirements, not just disabled people but also older people and parents with young children and buggies. More than 30,000 businesses display their access information on the website and this number is growing daily as London prepares for the London 2012 Games. Today, of the 1231 hotels on the website 891 are displaying access information. This information has been collected in many ways, in some cases locations have been audited by Direct Enquiries trained auditors, added by the business themselves or by the general public. Search lists are spearheaded by those businesses who have paid for a full Direct Enquiries access audit, undertaken to current legislative standards. InclusiveLondon.com displays external routes to these businesses, internal routes and plans, maps and general information. Organisations may also promote their facilities through short videos. “We work with organisations to ensure compliance with a growing body of case law surrounding accessiblity. Our websites offer accurate interactive, pictorial detail to build the confidence of people with specific access requirements so they can make informed decisions about which business to visit,” says Grant Kennedy, Managing Director of Direct Enquiries Ltd, a MITIE business. Where businesses have undertaken a guided self-assessment, InclusiveLondon.com displays a list of accessible features and services including whether there is wheelchair or pushchair access; whether induction loops are available or assistance dogs are welcome; baby changing facilities, accessible toilets, parking and much more. Basic information can be displayed by businesses free of charge and the general public may add and review locations. As well as the legal obligation every business has, there are huge commercial and social benefits to improving access and facilities so offering the best possible service to customers. The website has received more than 11 million hits since its launch in March 2011 from a market segment with an annual spending power, in the UK alone, of £350 billion. InclusiveLondon.com is promoted from the London 2012 Organising Committee website http://www.london2012.com and from the Official London City Guide http://www.visitlondon.com. 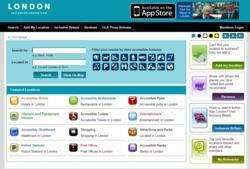 Launched in January 2012, the Inclusive London app received hundreds of downloads in the first few days. Featured as App of the Week by the Sunday Times, the Inclusive London app provides people with access information while they are out and about the Capital.